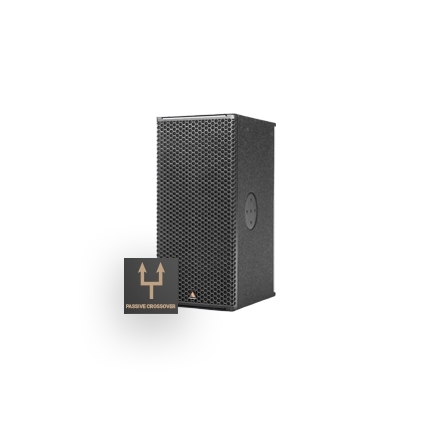 The IS7px is a passive 2-way, full range point source cabinet containing 2x ND7-LM16 Low-Mid drivers and an NH3-8 1.4” exit compression driver with a passive crossover, resulting in a nominal impedance of 6 Ω. The prolate spheroidal waveguide produces a nominal dispersion pattern of 70° x 40° (H x V), rotatable by 90° increments.. The design of the waveguide ensures equal tonal balance when moving outside of the intended coverage pattern, delivering natural sound with no diffraction or lobing. The cabinet construction uses marine grade birch plywood as well as aircraft grade aluminum and steel, and is equipped with two Speakon™ NL4 connectors (IS7px), or barrier strips (IS7pbx). A plate and screw rigging system is placed on four faces of the enclosure, with a multitude of accessories allowing the enclosure to be deployed seamlessly in a variety of applications. The IS7px is suited to a wide variety of applications. Its full range capability (80 Hz) at reasonable levels qualifies for applications where sub is not required. The choice in dispersion pattern enables the IS7px to supplement larger systems as a fill cabinet, or to handle smaller applications on its own. Other target applications include performing arts centers, live performance venues, sports venues, conference centers and houses of worship.